The campsite Anse du Brick is open from May to September and offers holiday homes at a campsite in Normandy. Located in the Cotentin at the Point of Brick, the campsite has a beautiful sea view. The location with the high rocks, opposite the sea and on the other side a natural forest offers all the ingredients for an unforgettable holiday with family and friends. Discounted prices or discovery week in la Manche, find out about our great deals for your stay in Normandy. When you stay in a mobile home, lodge tent, chalet or villa you have a fully equipped space: living room with TV, 1 or 2 bathrooms, WC, gas hob, microwave, 2 deckchairs, a barbecue, a garden set (with table and chairs) The number of bedrooms varies per chosen accommodation as well as the number of bathrooms. A pet of small size is allowed in each mobile home, lodge tent, chalet or villa. The camping pitches have a variable surface area depending on the type of the chosen pitch (from 90m2). They all have their own electricity connection on site for more comfort. (the number of Amps depends on the chosen type). Your camping site is limited and there are 3 sanitary blocks of high quality. (heated in low season). Since 2018: We offer camping pitches with private bathrooms. You can bring up to 2 pets at the pitch. Depending on the chosen category of the site, the campsite offers you additional facilities: Premium has, for example, a private barbecue, garden furniture with parasol and sun beds, free WIFI, etc. There is a private parking place for each pitch or holiday home. There is also a parking place at the beginning of the campsite, if you prefer not to park the car on the spot so you have more space on your pitch, your mobile home, your lodge tent, chalet or villa. Many activities are on site during your holiday at L’Anse du Brick. Go to the 5 star campsite Castel L’Anse du Brick and benefit from the rental of accommodation with many fun activities in Lower Normandy. During your stay you can have fun in the water park: swim in the heated outdoor pool or in the heated indoor pool, cozy with your baby in the paddling pool or go off the slide. Many outdoor activities are proposed for the little ones as well as for the adults. The children can have fun in the inflatable castle, the playgrounds, with the swings, table tennis etc. In July and August every morning except Saturday there is an animation team at the campsite, that provides the kids club for children between 5 and 10 years. You can rest while the children enjoy themselves. On the afternoon in the summer there are sporting animations. The rental of mountain bikes or kayak is possible and offers the possibility to walk in the forest or to sail along the coast. There are also sports grounds at your disposal (tennis, football ..) There is also a free concert or spectacle in the summer one evening a week. For your accommodation you have the possibility to choose between the rental of a mobile home, lodge tent, chalet or villa or camping sites for tent, caravan or camper. Depending on availability you can add the beautiful sea view option, so you have sea view from your chosen accommodation. Maupertus sur Mer is near many famous tourist attractions such as Saint-Vaast-la-Hougue (city known for its fortifications and the island of Ile de Tatihou), Sainte-Mère-Eglise or the bay of Mont Saint Michel. 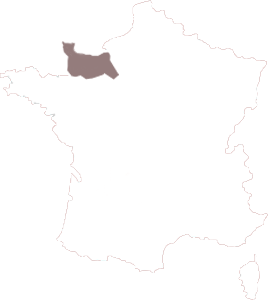 La Manche also gives access to the Calvados region and the channel islands of Jersey and Guernsey. L’Anse du Brick is close to many monuments from the Second World War: Caen Memorial, the landing beaches (Utah Beach, Sword Beach, Juno Beach, Gold Beach and Omaha Beach), the artificial port of Arromanches… Depending on your interests, we can inform you which places are definitely worth the effort. So do not wait any longer and book your holiday by the sea at the 5 star Castel Camping L’Anse du Brick!